This Low Cost, Low Carb Protein Is Perfect For Carb Watchers! Add some serious muscle to your body without the fat that can come from high carbohydrate diets. Elite is an effective way to gain lean muscle mass whether you are planning on bulking up or losing fat. This powerful protein supplement is made with extra high-quality protein, which makes it an excellent choice as the alternate source of dietary protein. As good as Elite tastes, you might expect it to be filled with sugar, artificial sweeteners or sodium, but no! Elite Whey contains only 1 gram of sugar per serving and is aspartame free. Plus, Elite Whey mixes smoothly and quickly in a glass or shaker bottle so it's convenient enough to use anywhere, anytime. Just add water, milk, or juice and drink! Elite is designed to work great, yet not break your bank. In fact, per seving, Elite not only costs less than the leading brand, it also costs less than most other sources of protein you eat. 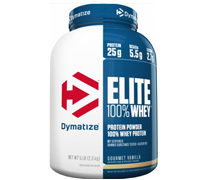 So if you are looking for a high-quality protein at an economic price, Dymatize Elite Whey is just your ideal choice. Vanilla Flavour shown. Nutritional information and ingredients may vary from flavour to flavour.